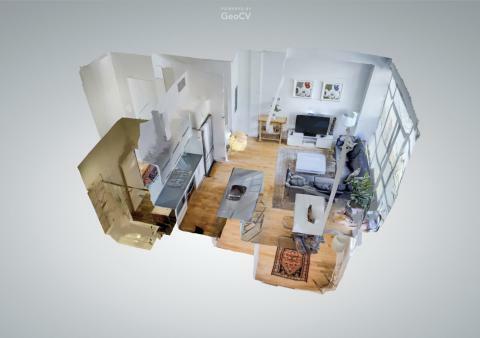 New York-based 3D capture startup GeoCV, raised $1.8 million in seed investment from Runa Capital, Emery Capital, and several New York angel investors. The company scans interior spaces using a 3D camera equipped smartphone and proprietary software. The space can be viewed in 3D from any angle in virtual reality (VR), or in a web browser. Unlike the company’s competitors like Matterport, that offer 3D scanners at a price of $4,500, GeoCV utilizes $500 smartphones with 3D cameras such as Lenovo Google Tango. “Our goal is to become the world’s №1 solutions provider for 3D capturing,” said Anton Yakubenko, GeoCV co-founder and CEO in an official statement. Matterport Scenes is easily the coolest Tango app for a Smart Phone, and it gives us an idea of how Tango sees the world. It makes a 3D point cloud of whatever you point it at and saves that image in a viewable, explorable 3D scene. An app like Matterport Scenes will be a stick in the eye to those who bought their camera for $$$$. A Tango equip Phone sensors go full blast with Matterport Scenes. The time-of-flight camera and IR projector constantly take 3D measurements of the world in front of them. They blast out points of light and measure how long they take to bounce back. This system doesn't see color, only depth, so the RGB camera is active, too. It applies some color to the 3D point cloud. You'll want to scan an object from multiple angles, so your movements are tracked by the fish-eye camera, which allows every new depth pass to be correctly applied to the growing point cloud. Once you're done scanning, Matterport Scenes saves your 3D scans to an internal gallery that's easy to navigate. A one-finger drag rotates the view, pinch-zoom zooms, and a two-finger drag pans. The app also has nifty presets like "3/4 overhead," "First person," and "Blueprint." You can measure your scans with a built-in ruler, there's a 3D crop tool, and the "share" button can send the full 3D data to another Matterport user. You can also snap a picture to send to everyone else. I don't have much direct experience with Tango devices and MP Scenes. I thought MP positioned its Tango app to just scan objects / small areas. I wonder if there is a range difference between larger sensors and Tango. Also, I think MP could eventually turn on Showcase to accept Tango models. There are probably business and technical reasons why it hasn't happened yet. I'm curious to see how the overall GeoCV UX compares to MP. MP camera is and will be the future. I can see upgrades in the pipeline. We are probably years away from having photorealistic 3D models of homes. By that I mean something that looked (at least) as good as Matterport panoramas but could be viewed from any place in the model, not just the pano locations like in Matterport's current product. Until we get to that point, something like Matterport's compromise between panos and 3D model is required. If they've done a good job protecting that innovation, they should be set against competitors for at least several years. During that time, drone technology will be advancing along with these 3D phone cams. Combining a tiny 3D camera with a small drone with a brain will allow a home to be scanned robotically. So there's no real reason to worry about the interim phase of realtors wielding 3D smartphones. The output will not be as good as Matterport tours until the tech gets to the point that the whole thing will be done by a drone robot anyhow. At that point, people like MSPs won't be in high demand, because real estate offices will probably just buy a 3d camera drone robot for a few hundred dollars for their agents to use. There will be some post-processing work that humans will probably need to do (annotating, curating, correcting), but that can all be done from the cloud without a visit to the actual property. I hope none of us are planning on Matterport being our long-term career to retire on, but it should be a good gig for years to come. @craigsauer Couldn't agree more. The question is -- if we will be made redundant -- where will Matterport be in the future of 3D drone technology? If I was doing long term (5-10 years out) business strategy for Matterport (and I used be a professional long term business strategist!) I would think that the future would hold a good possibility if they use their existing strengths to prepare to be a leader in the coming robot camera drone boom. Matterport has already got a lot of relevant technology for this future under its belt already, so as long as it keeps watching and developing, they could establish themselves as the trusted source for 3D scanning robotic drones. There should be quite a market for this, as updated 3D models of spaces, would need to be done quite frequently for certain purposes. For example, having a Matterport tour of a retail space currently goes out of date quickly and thus isn't great as the basis for an virtual storefront. But if the store could have a 3D scanner robot drone in the back that ran every night you could quickly put together a virtual shopping experience that matched the brick and mortar location almost exactly. And almost any non-trivial home renovation or construction project done in the future will start with a 3D model that will need to be updated frequently during the project. Too expensive generally to have an MSP come weekly to capture the project, but a drone that could run after work had stopped each day? But, by the time we get to this point in technology, robot drones will be doing lots of photo and video capture that currently require lots of human piloting and photography expertise. Next-gen reality TV, sports coverage (especially something like the Olympics), documentary filmmaking, citizen filming of police misdeeds, etc. will make robot (3D) camera drones something that will be ubiquitous. So if Matterport can take ownership of enough of that space it can move beyond its roots in 3D scanning for real estate to 3D photography and videography taken by robot drones.